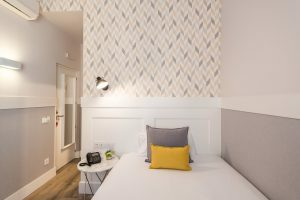 Velázquez 45 by Pillow is the reference hostel in the Barrio de Salamanca in Madrid. 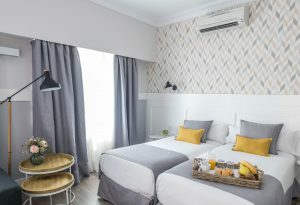 After a complete renovation of the old establishment, Hostal Residencia Don Diego has become the best option in its category both for leisure travelers and those who come for business. We offer a generous breakfast to pay directly at the hostel. 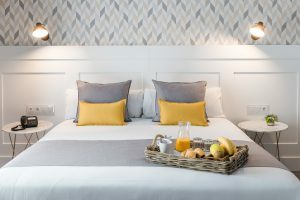 Located in the best shopping area of the capital, Velázquez 45 Hostal Boutique is a few steps from the metro station Velázquez and Serrano, and has a public parking nearby. Ideal situation for travelers who want to visit the Prado Museum,, the Reina Sofía or the Thyssen-Bornemisza. 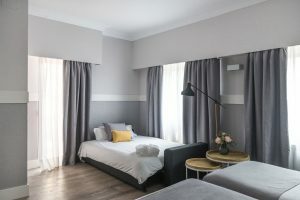 It is also within walking distance of the well-known Retiro Park, Puerta de Alcalá and Plaza Colón. Velázquez 45 by Pillow has 24 hours service, room types for all types of clients. All of them equipped with flat screen TV, safe, minibar, air conditioning and heating, shower and complimentary kettle. All the staff of byPillow speak different languages and will help you in everything you need: booking tickets, excursions, restaurant recommendations … Always at your disposal! !Do not miss it, we offer you free Wi Fi, book with us! Breakfast service: pay directly at the hostel:(9 euros/pax. Served from 7:30 am until 10:30am). Left luggage service pay daily. Walk through Madrid and discover its secrets, staying in the rooms at Velázquez 45 Madrid. Which one do you like best?